Autism Spectrum Disorder (ASD) is characterized by impairments in social communication, social interaction, and social imagination. Lack in social play and communication skills can slow learning and cognitive development in this population. There are many approaches that are utilized by parents of children with autism. Applied behavior analysis is a science that uses tested methods with proven results to help individuals with autism develop skills to support interaction and learning. Other methods of treatment may not have such support yet gain attraction in society due to powerful marketing tactics. 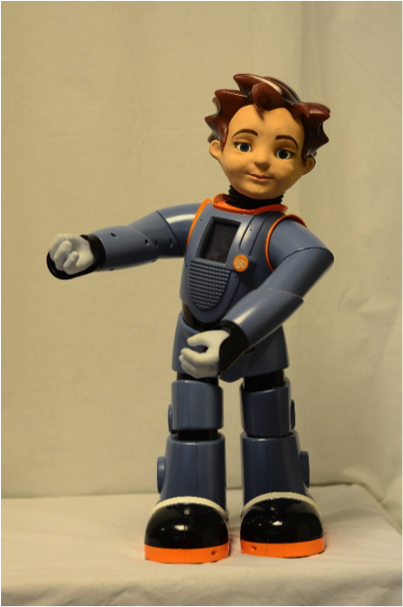 Enter Milo, a Robot4Autism. Milo is a child-like robot only a couple feet tall with tablet-controlled programs that are run with the instructor tablet and engaged in with the child’s tablet. Facial expressions displayed on Milo may scare an adult who grew up fearing Chuckie the Doll, yet can present opportunities for learning facial cues in children with autism who may not make eye contact with peers and adults. The extensive curriculum developed by autism experts covers a range of areas–from conversational skills to understanding social settings and emotion recognition. I have not had the opportunity to personally experiment with Milo in practice but found it to be an exciting tool that practitioners can add to their list in serving individuals with autism. Research directly related to Milo’s effectiveness is limited because this is a new form of technology-aided instruction. Still, Milo shows promise as a new technology that can help individuals with autism develop skills that may otherwise be difficult to achieve. Hopefully, research will soon show the benefit of using this new technology with individuals on the autism spectrum. Roger J. Matar is currently finishing his M.S. in Autism Studies at the University of Massachusetts, Lowell with the intent to test for the BACB after. Experience ranges from settings serving individuals with brain injury, Huntington’s Disease, foster care, Autism Spectrum Disorder, and oppositional defiant disorder. Roger, do you have any update on Milo?